Streets of the June were heated up with crowds who have come out to join in the procession calling on the truth of National Intelligence Service’ intervention in politics and the presidential election. The briefing of prosecutor’s office on 14 June failed to cool down but rather sparked the anger and suspicion of the people. The prosecutors merely indicted Won se-hun, the former president of NIS and Kim Yong-pan, the former president of Seoul Metropolitan Police Agency without detention and did not charge any of NIS employees for illegal activities and policemen who have involved in concealing and minimizing the case. On the other hand, a whistle blower was charged for leaking secrets and brought to the justice. Hence, it stirred up people to sign online for urging National Assembly investigation and university students to endorse public statements. Candle rallies started to spread out to fill the streets. As complaints are flooded by citizens, the leading and opposition parties have agreed on 25 June to execute National Assembly investigation. However, Nam Jae-jun, the president of NIS under Park Geun-hye government attempted to drive the situation to attritional ideological debate by illegally disclosing a recording of South and North summits’ dialogue in 2007. Unfortunately, this tryout was regarded as a new intervention of Park Geun-hye’s NIS that boomeranged with new critics and complaints. During June, PSPD has been standing in the middle of tornado of huge resistance of the people with no end in sight. PSPD will continue its work together with citizens and work harder to correct the state power which is having a psychological warfare against the people so that freedom and democracy of the people are sustained. • On 5 June before the prosecutors announced investigation results, PSPD has organized the Civil Society Declaration on NIS situation in which 200 organizations and 724 people from various field throughout the country participated. It opened the door for the relay of denouncements on current situation persisted during June. • After the announcement of the prosecutors, PSPD held a press conference on 18 June in cooperation with Lawyers for democratic society, the Watch Network for Public Security Organizations members and the Progressive Network Center and, urged for National Assembly investigation on NIS’s intervention in national politics and the presidential election. • PSPD reported 15 policemen to the prosecutors on 20 June for the charge of being involved in concealing and minimizing NIS’s illegal activities. On the following day, a written request to withdraw accusation on a whistle blower was submitted to the president of prosecutor’s office by the Informer Support Center for Public Interest of PSPD and the Group Supporting Informers for Public Interest. 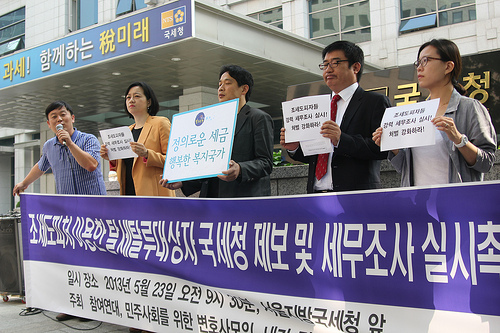 • Lee Seok-tae, co-representative of PSPD and representatives of the Watch Network for Public Security Organization members have met Kim Han-gil, the representative of Democratic Party on 25 June and demanded followings; △ Execute complete National Assembly investigation △ Punish all personnel involved in the NIS matters △ Prepare prevention measures and reform the NIS. The request was also made to meet Saenuri Party but turned down. • The application was submitted on 21 June to the Police to occupy pedestrian in front of Donga Daily for evening demonstrations for a month. This is to provide a space for the people who voluntarily come out to streets to freely speak out. However, the Police notified ‘not authorized’ on the ground of causing inconvenience to traffics and pedestrian walk. The space requested has been granted for other rallies in general so that this refusal is interpreted as authorities’ intention to block citizens’ peaceful protest no matter what. Therefore, PSPD submitted an application to the court for provisional disposition to void prohibition of demonstration. • 209 organizations including PSPD have gathered and held an emergency discussion on the current situation on 27 June. • As decided in the discussion, the first candle rally was held near Gwanghwamun at 8pm on 28 June. At 7pm preceding the demonstration, the Watch Network for Public Security Organizations hosted street lectures and talk shows in which professor Pyo Chang-won, Jin Sun-mi a member of Democratic Party and a lawyer Park Ju-min participated. ※ PSPD hasn’t demanded either invalidity of the presidential election result or execution of re-election so far. What PSPD tries to do is building solidarity of extensive citizens to realize complete investigation of the National Assembly. The investigation is expected to find the truth of NIS’s intervention in politics and elections and, their attempts to conceal. All the responsible should be punished accordingly to the findings and measures need to be prepared to protect informers and prevent reoccurrences. Bring the National Assembly into the arms of the people! The National Assembly is built with people’s tax. Then, how much is it open to the public? The main building and the front door of member’s building allow only assembly members to enter. Citizens can enter only through the back door. How about the playground? Except having events for president’s protocol or hosted by a secretary-general, it has never been authorized for the public use. Juveniles are limited to use even the library. It is not a matter of using the space. The national Assembly is said to be a sanctuary of the people’s mind and will but it is rare to find the people there. Reform of the National Assembly is a regular election promise but it always becomes blank after elections. There was a committee called Political Reform Special Committee at the 18th Assembly. Now it became National Assembly Innovation Special Committee and Political Innovation Special Committee. Committees come with different names but disappear with no fruits. Reforming the National Assembly, is it truly an impossible task? The program was consisted with ‘National Assembly O/X quiz’, ‘Let’s give my marks to the National Assembly’, ‘Discussion on the mat’, and ‘Direct question, Direct answer with National Assembly members’. Participants shared their opinions and ideas in the program including opening the National Assembly to the public, protecting human rights of juveniles, vitalizing communication with citizens, abolishment of member’s privileges and reform of election system. Nine members who joined the program listened and answered to people with their hearts. <Be open National Assembly, Communicate Politics> is a project planned and organized by civil organizations and some sensible members. The project will design and hold civil actions which can change the National Assembly and will be carried out from June 2013 to June 2014 when opening the 19th Assembly become two-year-old. Catch tax evaders abusing tax havens! One day in 2011, an anonymous parcel was delivered to the International Consortium of Investigative Journalists (ICIJ) and there was a high-capacity computer harddisk in the box. Soon after, what were written on the disk started to uncovered to the outside world. Extended information was released on tax evasions of who have set up ghost companies in tax havens such as Virgin Island. Big political and business figures mentioned in releases have stepped down from their positions and news on protest has followed one after another. Korea was no exception. <Newstapa> revealed the information on 22 May and the first list of tax evaders contained names of Chaebol families and their former and current executives. Additional releases created a big stir because not only names of politicians and businessmen but also social figures and public organizations were found in lists. The most notable names were OCI chairman , the former chairman of Korea Employer’s Federation and his wife, the chairman of Hanjin Shipping and, Jeon Jae-kuk, the first son of a former president Jeon Du-hwan. It is hard to estimate exact amount of offshore leaks but the seriousness of the matter has been already raised by national and international reports and thesis. The National Tax Service has established “Offshore leaks chasing Task Force” in the early Lee Myung-bak administration and promoted that it would stop leaks using international trades. However, the performance result was too low to publish. On the next day of the first release, the Tax Reform Center of PSPD held a press conference in front of the National Tax Service providing the list of tax evasion suspects and calling on complete tax investigation and following punishments. On 29 May, it also held urgent discussion <Situation, methods, prevention measures on offshore leaks using tax havens>. After the forum <Offshore leaks, Find a hole> hosted with a parliamentary member Park Won-seok on 17 June, the enactment of ‘Special decree on offshore leaks prevention’ was proposed which reinforce responsibilities of the government. The decree suggests protecting whistle blowers by easing civil and criminal punishment on them and giving rewards. It also includes strict punishment on tax managers such as legal agents, accounting firms and coordinators who introduce or/and assist tax avoidance. With this offshore leaks issue, PSPD suggests using a term ‘tax evasion zone’ rather than a commonly used ‘tax haven’ since there are intentions to avoid fair taxation. The press, politicians and experts are joining in the use of term ‘tax evasion zone’. It is a non-profit organization in which more than 160 journalists from over 60 countries are participating. Located in Washington D.C. in US, it was established by the Center for Public Integrity, a public workers surveillance organization in 1997 in order to strengthen investigative journalism to deal with corruptions and inter-state criminals. What is the situation on Korean Human Rights Defenders? Margaret Sekagyya, UN Special Rapporteur on the situation of Human Rights Defenders noted at the press conference before departure briefing on her visit to Korea. She has officially visited Korea from 29 May to 7 June. ‘Human Rights Defenders’ refer to activists who try to protect and promote human rights. It embraces not only activists working for human rights organizations but also anyone who act for human rights. By this definition, workers fighting for abolition of irregular employment, people fighting against redevelopment infringing the right to residence, residents trying to protect their village and area from destroying the environment, people resisting with non-violent method against violence of public power, activists for the rights of sexual minorities, they are all human rights defenders. Korea is a member state for UN Human Rights Council. Then, how is the situation of human rights defenders in Korea? Participating in peaceful assembly is finable. At redevelopment construction site, it is not rare to see human rights defenders beaten by securities who are protected by the police. Sometimes, defenders are tagged with ‘Pro North Korea’. The purpose of UN special rapporteur’s visit is to investigate these situations, review and give guidelines and recommendation to protect those who act for and promote human rights. During the visit, the special rapporteur has met ministries, the National Human Rights Commission of Korea, and human rights NGOs. She went to Ulsan, Milyang, Jeju and Gwangju to listen their voices who have been struggling at the human rights infringement scenes. Activists from 29 Human Rights NGOs have handed over ‘2013 Report on situation of Human Rights Defenders in Korea’ to the special rapporteur. The report contains suppression cases on Korean human rights defenders, voices from sites and recommendations. Based on her visit, the special rapporteur announced the first investigation results at the departure press conference on 7 June. The results express concerns and recommendations on various legislations concerning suppressing human rights defenders, excessive damage and compensation claims and use of public force. Above all, the visit of the special rapporteur recalled that people who have been suppressed by the governments are in fact ’Human Rights Defenders’. 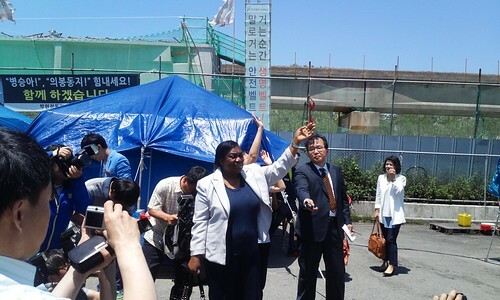 Elderly who are blocking transmission tower construction in Milyang, labors demonstrating at Daehanmun, Gangjeong residents and activists stopping naval base construction in Jeju, they are all fighting for human rights and should be protected by the government. Elaborated results will be produced in a full report and submitted to the 25th Human Rights Council in March next year. Now, it is the turn for the government to answer.